The problematic of rural Ireland and the rapidly emergent conditions of an increasingly urban-focused economic recovery has recently hit the headlines and moved front-and-centre in the concerns of both the media and government. RTE aired the “The Battle for Rural Ireland” documentary featuring the forlorn parents of emigrants and boarded up rural towns followed by the all too familiar, and equally depressing, ‘debate’ on Claire Byrne Live. The column inches of newspapers have similarly carried numerous commentaries on the flatlining rural economy and rural depopulation with the chair of the government’s CEDRA commission, established to champion rural development, decrying the painfully slow progress in implementing its rural job creation strategy. Dr. Brian Hughes on this blog and in the national media has been to the fore in arguing that the notion of balanced regional development is a fallacy and that “the future is urban” – something which the political class is loath to accept. Meanwhile, Taoiseach Enda Kenny has declared 2015 “the year of rural recovery” where the fruits of economic growth will be spread equally across the land. Minister Simon Coveney was also on message pointing to the resurgence in agriculture and that reports of the demise of rural Ireland had been greatly exaggerated. The IDA has even been mandated to develop new strategies to convince multinationals to invest outside of major cities while the Department of Jobs, Enterprise and Innovation proposes to publish new Regional Enterprise Strategies. 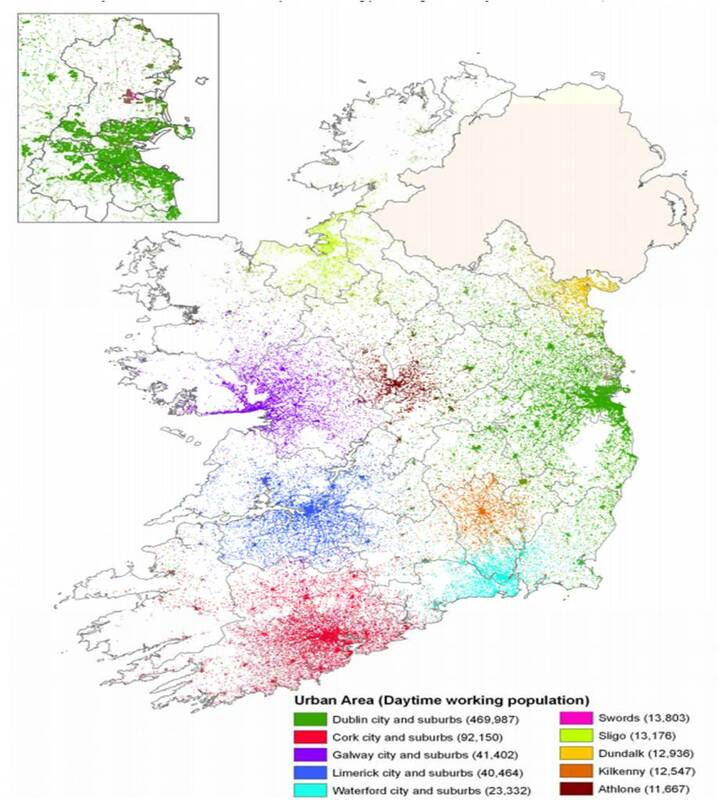 Ireland’s uneven economic geography – temporarily masked by the property bubble – has re-emerged as a major political battleground for the upcoming general election and the trite urban versus rural ‘Punch ‘n’ Judy’ show, which has disastrously hampered the national territorial planning agenda for decades, appears set to continue in perpetuity. Such is the political uneasiness that, just like in 2002 when the publication of the NSS was delayed by a general election, it is unlikely that the proposed new National Planning Framework (NPF) will be seen any time before 2017. Plus ça change. Maintaining the contested urban/rural political soapbox serves only as a comfortable façade for a body politic to beat their chests and engage in a disingenuous performance of seriousness towards the welfare of ‘Rural Ireland’ while the inevitable reality unfolds around them. As a consequence, in a typical Irish solution to an Irish problem, we have unwittingly managed to produce the worst of both worlds – places that are neither city nor countryside – and much of the unplanned spatial chaos we have inherited today. Somehow, along the way Irish policymakers seem to have conflated economic spill-overs with sprawling ex-urban zones of high accessibility as a prescription for halting rural depopulation (what Fianna Fáil’s Eamon O’Cuiv approvingly terms the ‘melting ice-cream effect’). Therefore, perhaps the biggest mistake the new NPF could make is to continue with this hackneyed straitjacket of the urban/rural binarism and the notion that Ireland can be analytically carved up into two distinct spatial categories for intervention. The ignored challenge facing ‘Rural Ireland’ is, in fact, that it is in variously advanced stages of becoming urbanised. If we continue to relegate ‘Rural Ireland’ as being outside the urban condition then we will forever misdiagnose the problem. As a result, we will persistently fail to frame the appropriate policy responses to address the implications of these ongoing processes for the future forms and pathways of urbanisation and, more generally, for the organisation of the built environment. Perhaps it’s time to confront an uncomfortable premise – ‘Rural Ireland’ no longer exists.